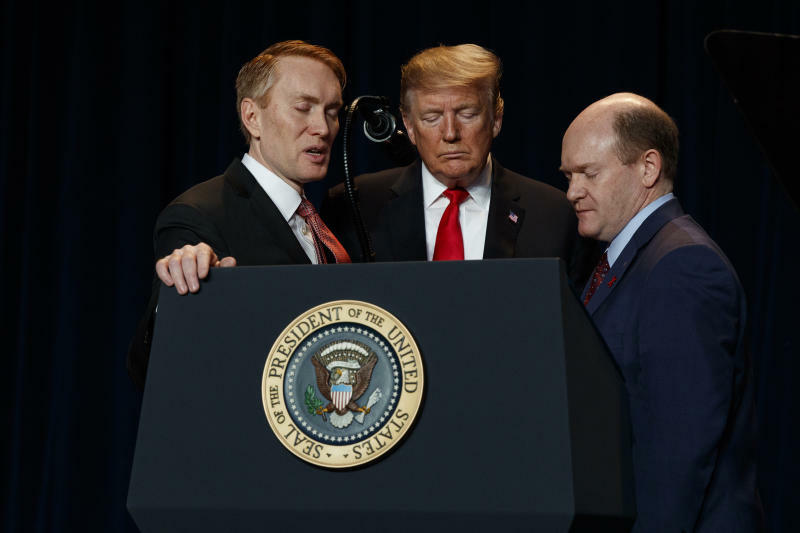 "As part of our commitment to building a just and loving society, we must build a culture that cherishes the dignity and sanctity of innocent human life," Trump said at the annual National Prayer Breakfast. "All children, born and unborn, are made in the holy image of God." In that speech, Trump incorrectly claimed that Gov. Ralph Northam, D-Va., when discussing late-term abortions in which the infant is severely deformed or unable to survive after birth, had said "he would execute a baby after birth." Trump also had urged Congress to prohibit what he described as "the late-term abortion of children who can feel pain in the mother's womb." The prospects of legislation restricting abortion rights passing a Democratic-controlled House appear remote. "I will never let you down," Trump told an audience that included members of his Cabinet and Congress, including House Speaker Nancy Pelosi, D-Calif., whom he did not acknowledge. "As president I will always cherish, honor and protect the believers who uplift our communities and sustain our nation," he said. "With his poll numbers in a free fall due to his government shutdown and the ongoing investigations into him, his family, his White House, his business, his foundation, his inaugural committee and his transition, Donald Trump's newfound love of talking about abortion is all about throwing red meat to his shrinking political base in hopes of political survival," she said in a statement. Trump also praised Karen Pence, the wife of Vice President Mike Pence, as an "incredible second lady" and noted that she recently began teaching art classes at a Christian school in Northern Virginia. The Immanuel Christian School has been criticized for its policy barring gay students, parents and employees. A document posted on its website says the school can refuse admission or discontinue the enrollment of any student "if the atmosphere or conduct within a particular home, the activities of a parent or guardian, or the activities of the student are counter to, or are in opposition to, the biblical lifestyle the school teaches," including "participating in, supporting, or condoning sexual immorality, homosexual activity or bi-sexual activity." Gary Haugen of the International Justice Mission spoke before Trump and talked at length about what he described as a "fracturing of the American family."